Monarch Air Group provides private air charter in Allentown, PA. Our clients benefit from top-notch service, unrelenting dedication to safety, wide selection of aircraft, and years of experience in chartering private jets. To obtain a free quote, please use our online quoting tool provided below, or call toll free 1-877-281-3051. Monarch Air Group provides private jet charter flights in and out of Allentown, Pennsylvania, USA. Located in Lehigh County, Allentown is a commercial and industrial city in eastern Pennsylvania, on the Lehigh River. It is 3rd most populous city of Pennsylvania, and the 215th largest city in the USA. 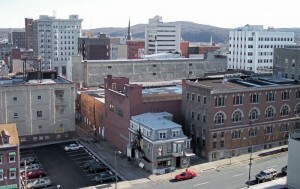 With a population of about 118,032 people, Allentown is the fastest growing city in its state. With wonderful museums, amazing parks, numerous landmarks and gourmet cuisine, Allentown is an enjoyable place that attracts both business and leisure travelers worldwide. The most popular tourist attractions include Coca-Cola Park, America on Wheels Museum, Da Vinci Science Center, Allentown Fish Hatchery, Allentown Art Museum, Dorney Park & Wildwater Kingdom, Lehigh County Heritage Center, and much more. The city is served by Lehigh Valley International Airport (ABE / KABE), which is located 7 miles from the center of Allentown. 1. AVP, Wilkes-Barre/Scranton International Airport, Wilkes-Barre/Scranton, PA, United States. 2. BBX, Wings Field, Blue Bell, United States. 3. CDW, Caldwell Wright, Caldwell, NJ, United States. 4. CTH, Chestercounty Carlson, Coatesville, United States. 5. CYE, Crystal Lake, Crystal Lake, United States. 6. DYL, Doylestown, Doylestown, United States. 7. ESP, Birchwood-Pocono, East Stroudsburg, United States. 8. EWR, Newark Liberty International, Newark, United States. 9. HZL, Hazleton, Hazleton, United States. 10. ILG, Greater Wilmington, Wilmington, United States. 11. JVI, Central Jersey Regional Airport, Manville, United States. 12. KPD, King Of Prussia, King Of Prussia, United States. 13. LDJ, Linden, Linden, United States. 14. LLY, Burlington County, Mount Holly, United States. 15. LNS, Lancaster, Lancaster, United States. 16. MMU, Municipal, Morristown, United States. 17. MPO, Mt Pocono, Mt Pocono, United States. 18. MUI, Muir AAF, Fort Indiantown, United States. 19. NXX, Willow Grove NAS, Willow Grove, United States. 20. PCT, Princeton, Princeton, United States. 1. Four Points by Sheraton Hotel & Suites Allentown Airport, 3400 Airport Road, Allentown. 2. Four Points by Sheraton Hotel & Suites Allentown Airport, 3400 Airport Road, Allentown. 3. Four Points by Sheraton Hotel & Suites Allentown Airport, 3400 Airport Road, Allentown.